Been so busy this month so far, it felt good to slow down a bit. Yesterday was a slow day for me, but I did get some running in. Nathan and I ran to Church and Yonge from home, then did some errands and walked home. It felt good to get out, but I had stuff to do at home. As I didn’t start my stopwatch properly, I didn’t get the time for our run yesterday. Ah well, I’m hoping to get some more running in today and good workout at the do jang and gym. Nathan’s Story Will be Published! Yay! In case people have not been reading Nathan’s blog along with mine (see my links at the top right corner), I would like to happily announce that one of his short stories will be published in a U.K. horror magazine, Thirteen! See Nathan’s blog entry, First Time in Print!, for more information. Finally, got into the do jang today! Spent so much time doing some writing this week that I didn’t make it into the do jang all week and didn’t get much running in either. So, went to gumdo class and got to practice my patterns and do some paired sparring drills. Afterwards, I headed home then Nathan and I went for a run. We ran up to Yonge and Church, then walked back. The total distance on the route we took was about 1.35 km, not quite 1 mile, which we ran in 8 minutes 19 seconds. Our speed is improving. I think next I will have to push my speed again and try to run 1.5 miles or 3 km easy (1 mile = 1.6 km). Hm, I’m starting to like running more. Some days I miss it when I haven’t ran. As Chan has stated before, Hollywood is not ready to take him seriously. His biggest complaint is that he’s tired of doing to same old roles. Every script Hollywood sends him is “the killer from China, the killer from Hong Kong.” Chan states that he wants to do drama and fantasy and that he’s a serious actor. “Jackie is not action star. Jackie is the actor who can fight. He’s not the fighter who can act.” I see his point, does Hollywood think every Asian male is just some killer or super street fighter? In addition, Jackie Chan is well aware that an action star’s career only lasts awhile. As he is now in his early 50s, Chan is concerned with his well-being and being able to act 20 years down the road from now. As a fan of Chan’s sense of on-screen humour, I have to agree with him. He needs to cut down on the stunts (at least cut out the extremely dangerous ones), so that years later we can still enjoy his charismatic personality on the big screen. Aside from Chan’s personal safety concerns, what is really going on with Hollywood and how do they deal with Asian male actors? One part of the problem is that Hollywood is not quite ready to depict romantic and sexual relationships between Asian males with non-Asian females much less have an Asian male play opposite a non-Asian female. In many ways, Hollywood still has its biases. Jet Li too has had his chance at the Asian male/non-Asian female relationship on-screen. (See http://forums.yellowworld.org/showthread.php?t=4933.) In Romeo Must Die, he starred opposite Aaliyah (yes, the singer) (see http://www.aamovement.net/art_culture/filmreviews/romeomustdie.html for a review of the movie as I have not seen it) and in Kiss of the Dragon, he played opposite Bridget Fonda. As with the Chow Yun-Fat movie’s above, the romance between Fonda’s and Li’s characters was only alluded to and although in the end they were seen together (plus her daughter), the audience was left to wonder if they stayed together and had a relationship. Again, there was no kiss. Jackie Chan’s on-screen “romances” with non-Asian females has been much the same as Jet Li’s. In The Tuxedo, an attraction to Jennifer Love Hewitt’s character is implied, but nothing was ever made of it. (Though you get the impression from watching the bloopers that Ms. Hewitt might have been slightly interested in Mr. Chan.) Though a little less prominent, if I recall correctly, Chan’s character in Shanghai Noon attracts the attention of a Native American, however, he’s not interested as his character is supposedly interested in the Asian female, a Chinese princess played by Lucy Liu. It’s not that Jackie Chan hasn’t ever done romantic roles. His movie Gorgeous is the most notable. However, of course, the love interest was an Asian female. One can’t argue that there aren’t any willing non-Asian females either. Mallika Sherawat, who stars in Sen-Hua (The Myth) with Jackie Chan, appeared at the Film Festival and said that she was disappointed that she didn’t get to kiss Chan in the movie. In her mind, starring in a Jackie Chan film is the same as starring in a James Bond flick. Hollywood’s reluctance to depict these kinds of inter-racial relationships has caused a stir in the past with Media Action Network for Asian Americans, an organization that monitors media depictions of Asian Americans. According to this article http://www.alternet.org/wiretap/16300, the reluctance to depict the Asian male/non-Asian female relationships could simply be a reflection of societal trends. It is so far more likely to have an Asian female dating a non-Asian male. However this doesn’t mean that the Asian male/non-Asian female relationships don’t exist or should be ignored completely. The biggest problem this bias produces is not giving Asian males a chance to act in diverse roles in Hollywood, it’s like Jackie Chan has stated, it’s always “the killer from China, the killer from Hong Kong” or as pointed out in the WireTap article above, it’s some geek or nerd role. Am I the only one to notice this trend in Hollywood? No. Read “The Yellow Menace in American Popular Film: 1991 through 1995” by Jeffrey B. Ho for an idea of how Asian males have been depicted in Hollywood cinema to 1995. I think it’s clear Hollywood still has a long way to go. With all this going on in Hollywood, no wonder Jackie Chan went back to China – at least there’s a chance he’ll get more interesting roles and his career will last a longer time. Here’s a review of Jackie Chan’s new movie. It is definitely something different to see if you’ve gotten used to his roles from Rush Hour. Sen-Hua (The Myth) is directed and co-written by Stanley Tong and stars Jackie Chan (who along with being stunt choreographer also had his film company, JCE Movies Ltd., produce it). In a movie Stanley Tong co-wrote with Jackie in mind, this is Jackie Chan Hollywood failed to take advantage of and Jackie Chan everyone outside of China has never seen. If you couldn’t see this movie during the Film Festival, you should be hoping it is released this year so you don’t miss out. The movie is a mix of the Indiana Jones-type adventure with the traditional Chinese historical action flick. Jackie Chan has a dual role in this movie – he plays the present-day archeologist, Jack, and the historic General Meng Yi who falls in love with Emperor Qin’s Korean concubine, Ok-Soo (both of whom Meng Yi has sworn to protect). In present-day, Jack has been having dreams of being the General and is not quite sure what his dreams mean. Then, by some twist of fate, his long-time friend, a scientist named William, leads him on a quest for a magical stone which causes things and people to levitate. It is on this quest that Jack sees a perfectly preserved painting of the woman of his dreams (the Korean concubine, Ok-Soo) and (unintentionally) obtains the legendary sword of General Meng Yi. When Jack is tested with the sword (he has an unexplicable bond with it, or not so unexplicable if you believe in reincarnation), he realizes that William’s quest and his dreams are tied together somehow. Jack’s dreams are clues to the past and to the answer to some of China’s greatest mysteries – immortality, Emperor Qin, and the Heavenly Palace! Of course, Jack and William are not the only ones who know about his dreams and their quest – no Jackie Chan film would be complete without the ultimate villain. As always, our hero has to defeat the villain(s) and still manage to fulfill his quest. Along the way, we also find out what happened to Jack’s dream woman and Meng Yi’s love, Ok-Soo. Stanley Tong co-wrote Sen-Hua (The Myth) with Li Hai Shu and Wang Hui-ling of Crouching Tiger, Hidden Dragon fame, which explains the epic familiarity of the story and the vast landscape scenery. However, the mood of the movie is markedly different from Crouching Tiger, Hidden Dragon, likely due to the comic relief provided in the present-day scenes. Jackie Chan’s brilliant humour and famous slapstick comedy is effectively used to lighten the underlying seriousness and tragedy of the story taking place in the past. Whatever tragedy has occured to General Meng Yi in the past is now mitigated by the relative peace Jack has in the present. Reviews for Sen-Hua (The Myth) are so far mixed, in spite of the long standing ovation received during the Gala and World Premiere at the Film Festival. (I, unfortunately, did not see the Gala showing, but the regular screening at the Festival.) Overall, I thought the movie was exciting and fun to watch while at times being appropriately dramatic. The ending surprised even me. As for Jackie Chan’s performance, Hollywood thought he couldn’t be taken seriously as an actor (see my next post above), he was just an action star to give roles that no serious actor would take. He may have just proven Hollywood wrong with this movie. He plays well as the loyal General Meng Yi who would sacrifice everything for his honour and his love. Finally, Jackie Chan gets to play a role he’s always wanted to play. 1. Jackie Chan sings (in Cantonese) the love song featured in the movie. 2. Stanley Tong and Jackie Chan waited eight years to do another movie together. Here’s some more movie reviews – a new way to experience silent films and a strange way to tell a love story. Nanook of the North is considered in the film industry the movie that created the documentary genre. The inspiration for making the movie came when the director, Robert J. Flaherty, was on an expedition in the Hudson Bay area. The director was there to prospect the land for development. While there he encountered the Inuit. Over the years, he became fascinated by them and their culture. Realizing that the Inuit way of life was at risk of dying out (with the approach of industrial development to that area), Flaherty decided to document the Inuit way of life. Nanook of the North is a silent movie made in 1922 and it was selected for the Film Festival this year as the silent film presentation accompanied by live music. The movie itself is fascinating for its historical depictions of Inuit life, but the experience of the film was greatly enhanced by the live music. The Inuit throat singers were superb in their performance, capturing the essence of what was portrayed in the various segments of the movie. The score for the movie was composed by Gabriel Thibaudeau and was performed by a nine-piece ensemble. The ensemble consisted, along with the throat singers, clarinet and flute players, which happen to be my two favourite wood-wind instruments. (I played clarinet for five years in high school and flute for a year, the flute being my minor instrument.) I’ve always loved the airy, ethereal sound of the flute and the clarinet. Having had some experience with the clarinet and the flute, I have to say that the performance was excellent. This is the first time I have gone to see live accompaniment with a movie at the Film Festival and I have to say it is worth experiencing, especially since the tickets for the movie and live performance are the same price as the regular tickets at the Film Festival. Hopefully, next year’s silent film selection will be as interesting as this year’s. Drawing Restraint 9 is the ninth installment of Matthew Barney’s Drawing Restraint project, a project he’s worked on since 1987. The project is based on the idea that resistance builds muscle tissue making muscles bigger and stronger through hypertrophy. Barney has applied this simple idea from physiology to the realm of creative expression. Simply put, would applying resistance to methods of creative expression produce better (bigger and stronger) art? In Drawing Restraint 1 and 2, Barney ran up an incline strapped to an elastic band, all the while attempting to draw. In the movie, Drawing Restraint 9, Barney has elaborated further on his idea using a variety of “restraints”, such as a mold containing liquid vaseline and the ceremonial process he has to go through in anticipation of waiting to be with his one love (portrayed by his wife and music artist, Bjork). The movie is described on the Drawing Restraint site as “an abstract fairy tale carried by striking visuals and music (much like opera), which draws its inspiration from Japanese cultural tradition, the history of petroleum-based energy, and the evolution of the whale.” Ultimately, the movie is a love story which culminates in a major transformation of the two main characters (Barney and Bjork). Considering this all takes place on a whaling ship, one should be able to guess what transformation takes place. There is a little dialogue in this 2 hour-15 minute movie (the only dialogue occurs during the tea ceremony, which was for me one of the more interesting parts of the movie – the other being the traditional Shinto grooming and dressing up in traditional Shinto wedding attire) which makes it a treat for the audience to have Bjork compose the soundtrack for the film. However the soundtrack matched the long and drawn out scenes of the movie so well that it didn’t make watching the movie any less of an endurance test of trying to stay awake. At the point where my eyes were starting to close, it dawned on me that maybe this was another “restraint” being used in the movie – the audience restraining itself from falling asleep because the movie is extremely long and drawn out (somehow this made it a little easier to stay awake). This is perhaps my biggest displeasure with the movie. A story was told and an idea was presented in 2 hours and 15 minutes that could have been told and presented in much less time. It probably might have been less time consuming to get the soundtrack and listen to that instead. If you’re a Bjork fan, the soundtrack is probably more enjoyable than the whole movie. Realizing that the idea for this movie came out of the idea of “restraining oneself”, the idea behind the Drawing Restraint project seems to have taken backseat to the love story. I left the theatre not quite sure what the movie had to do with “Drawing Restraint”. 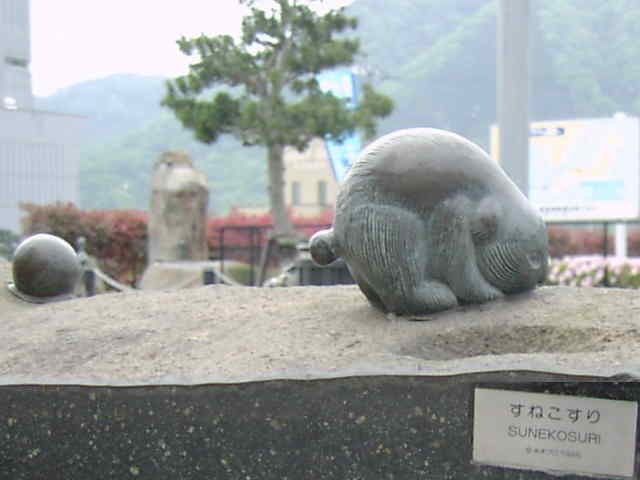 Okay, I really thought the sunekosuri was cute in The Great Yokai War, so I had to do a Google search for it. 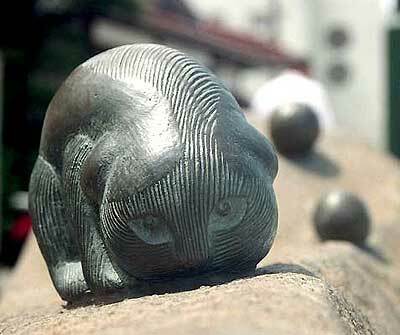 There is not much information about this interesting Japanese spirit creature, but I did manage to find some pictures. 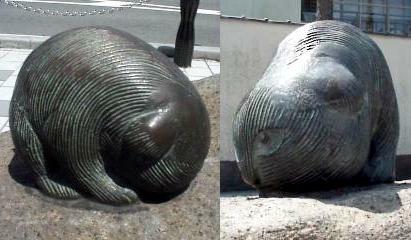 Apparently, sunekosuris do exist in Japan or are thought to exist. Today, I decided to run to the gym and then do some weight training. It’s been a good week since I did any running and about 3 days since I had any exercise. The break was good for me, though it was a bit hard running and exercising today. The run to the gym was a little more than 1 km. I didn’t run straight there but added some more distance hoping to make it a mile, but as it turned out it was a few kilometres shy of a mile. I ran to the gym in 7 minutes 48 seconds. Next, of course, I did some stretches which always feel good. I hate having a stiff body. Energy just feels so inhibited when the body is stiff. Stretching out the body on a regular basis allows energy to flow easily throughout the body. Think about those Tai Chi grandmasters and you can see the difference. Finally, after that workout, I decided to run (not walk) back home. I ran straight from the gym back home. It’s 1 km and I manage to do that in 7 minutes 7 seconds after tiring my muscles out at the gym. So, I’m happy. I ran to the gym, did some weights, and ran back. It’s a good way for me to get running in and build up endurance. You are currently browsing the Pneumatised! weblog archives for September, 2005.